Rarely do issue films make auds think as well as feel, so it’s nice to report that scripter-helmer Mohamed Diab has tackled Egypt’s hush-hush problem of sexual harassment with directness and nuance. “678” deftly connects three women from different social backgrounds and throws in a terrifically dry-witted investigator, forcing viewers to question assumptions and prejudices while refusing to offer up easy answers. Though its merits stand alone, this window onto Egyptian society should prove popular on the fest circuit given the country’s current strife. News stories about the ongoing anti-Mubarak protests remarked on the absence of sexual harassment among the enormous crowds; undoubtedly, the attention given to this endemic problem can be connected with “678,” whose popularity at home following a December opening generated major debate and even lawsuits claiming the pic shames the nation. Luckily, the movie’s strengths, as well as the presence of megawatt stars and the inevitable changes brought about by the present unrest, should speak for themselves. Working-class mom Fayza (Bushra) is fed up with the gropes she endures on the bus: Neither her head scarf nor her baggy clothes reduce the daily humiliation of men copping a feel. Hubby Adel (Bassem Samra) works two jobs to pay the rent, and when he gets home, he expects his wife to give him some action, but she can’t bear to be touched now. After watching a TV program about sexual harassment, she audits a class in self-defense given by Seba (Nelly Karim). Upper-class Seba has a good life and a good husband in Sherif (Ahmed El Fishawy), but after a gang disturbingly harasses her (well filmed), Sherif’s wounded male pride means he can’t even hear her sense of violation. Fayza seeks advice from Seba after reflexively stabbing a few gropers with her veil pin, and though the two women know it’s wrong, they’re relieved to be fighting back. Also seeking out Seba is Nelly (Nahed El Sebai), a wannabe comedian and fiancee to standup comic Omar (Omar El Saeed). After being assaulted on the street, she risks her family’s reputation and her relationship in order to file Egypt’s first sexual harassment lawsuit. All three women come in for questioning by police detective Essam (Maged El Kedwany), who’s investigating the mysterious stabbings. In his helming debut, Diab throws a harsh light on this issue via a deft combination of anger and humor. While taking as incontrovertible the feelings of violation engendered by sexual assaults, he explores associated emotions that make the issue especially volatile in religiously conservative countries where shame is used as a weapon to keep women “in their place.” When Fayza lashes out at women who wear provocative clothing and keep their heads unscarved, claiming such behavior encourages disrespect, the character is addressing a common argument. To Diab’s credit, he refuses to sanction this idea but makes it clear why such accusations can be powerful. The cast is so uniformly strong, it’s difficult to single out particular perfs, though both Bushra, a singer and actress, and El Kedwany won Dubai’s thesping prizes. Neither has ever been better: Bushra’s physical/emotional exhaustion is as palpable as her fear and anger, while El Kedwany’s cynical yet wise detective provides a crucial channel into the story as the adversary who’s really an ally. Karim and El Sebai are also excellent, their fiercely righteous anger making their misjudgments understandable. For the first 40 minutes, the pic shifts back and forth in time until it brings the three protags together; from then on, the narrative becomes linear. 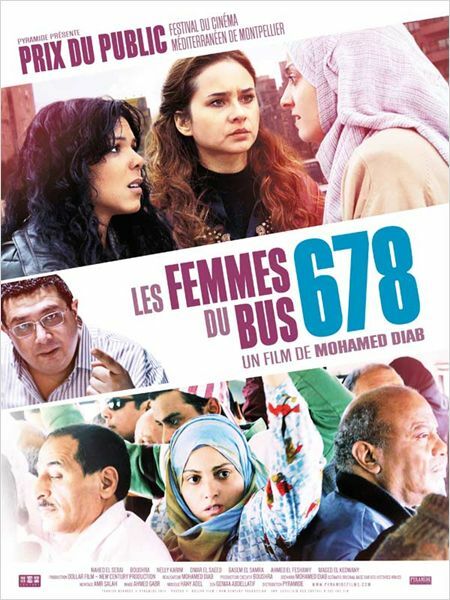 Ahmed Gabr’s handheld lensing is modulated to fit the moods, though some of El Kedwany’s scenes feel a bit too indebted stylistically to “Law and Order.” The title “678” refers to Fayza’s bus, but the consecutive numbers are also meant to connote an escalation of tension. Other US critics who saw the pic at film fests also gave it the thumbs way up (here and here). For a trailer see here (also see the report here). An interview with director Mohamed Diab (who seems like a very cool guy) is here. One notes that Jay Weissberg’s Variety review was filed on February 9th last year, two days before the fall of Mubarak and the huge celebration in Tahrir Square that followed. For Americans at least, that day will also be remembered for the mob attack on CBS correspondent Lara Logan in the same square (and which a prominent US lefty journalist initially made light of; quelle ordure ce mec…). The mobs that attacked Logan and other women in Tahrir Square then and after—one of them the courageous Egyptian journalist and publicist Mona Eltahawy—were thought by many to be made up of baltagiya—regime-hired thugs—, which may or may not have been the case. We’ll likely never know. 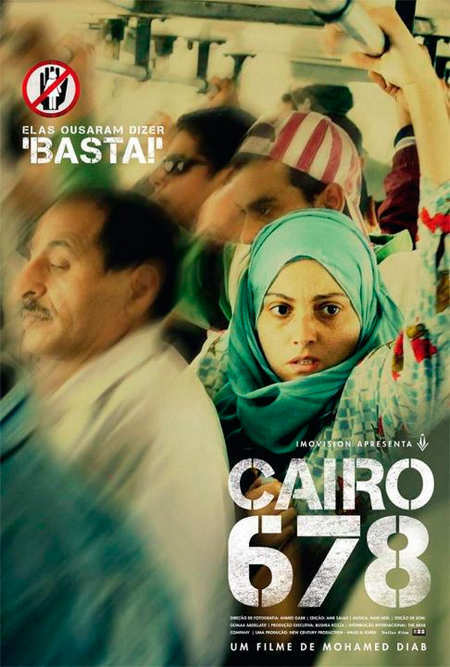 But ‘Cairo 678’ graphically depicts such an attack—by celebrating soccer fans—on one of the women protagonists and the film was made before the popular uprising against Mubarak. So such attacks on women in Cairo were and are not just the doing of baltagis. The attack on Lara Logan no doubt gave many Americans the unfortunate impression that Egyptian/Arab men are misogynistic a**holes and that there is something sick about those societies. Well, there are indeed such men in Egypt—as there are everywhere—and on the matter of gender relations there are some issues that are specific to that part of the world. But it has to be said that Egypt was not always this way. When I lived in Cairo in the mid 1980s it was absolutely one of the safest cities in the world, on a level with Tokyo, and that likely had less crime than even Oslo or Stockholm. One could leave one’s apartment door unlocked and walk about anywhere at any time of the day or night without the slightest worry. And this was also the case for women too (maybe not late at night, but then hardly anyone went out late in Cairo back then; the city was asleep by 11 PM). The situation has changed considerably over the years, with the worsening economic conditions for so much of the population, overwhelming population density, etc, etc. Egypt is incontestably a coarser, more violent place nowadays than it was in past decades. The film, which is otherwise very feminist, does show the complexity of the situation in regard to men. They are at once sexist jerks but also victims themselves in many ways, of their culture, economic situation (often rendering it impossible to get married or find housing), and absence of any hope for the future. And they do have feelings. The film also depicts how women themselves can act as enforcers of the sexist gender hierarchy. Moreover, the film’s veritable hero turns out to be a man and an unlikely one at that: the gruff, corpulent police inspector (played by a well-known Egyptian comic actor).